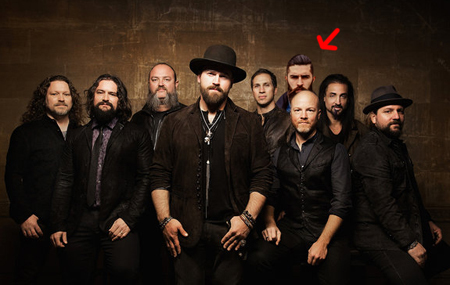 The Zac Brown Band has added a new member to its already large roster, unbeknownst to Zac Brown. FNN has learned that "rhythm guitarist" Jesse Carlsworth of Pittsburgh has been touring with the hit country group of his own accord since their performance in his city in July. He is not listed on the ZBB website or the CD booklet for their newest release You Get What You Give, but has found his way onto a couple of concert t-shirts and promo shots. At the band's recent show in Charlotte, NC, Carlsworth appeared onstage, heavy with facial growth and clad in a plaid shirt and torn jeans. Nothing seemed askew, as he shared between-song banter with other members and pretended, adequately enough, to play rhythm guitar throughout the 18 song set. During the coda of the final song, Zac Brown recognized all the band members, but looked perplexed when he came to Jesse, saying "and there's uh, ol' Zeke on second rhythm guitar." A call to management has gone unreturned, but attendees from other recent concerts have reported similar stories. "I didn't think nothin' about it, he was singing harmony just fine, I think," said Jeanie Luke of Phoenix. "You mean he ain't really in the band? I got him to sign my left boobie in the parking lot after the show!" For its part, the band has welcomed Jesse with open arms, despite confusion regarding the status of his employment. "I just figured Zac signed him," said drummer Chris Fryar, "and I don't guess Zac has paid him much mind and I haven't had time to ask because Zac's always cooking before and after shows." The Zac Brown Band, Jesse Carlsworth in tow, hit Indiana, Missouri and Kansas through the weekend.